For the period ending February 02, 2018 ... New DVD and Blu-ray selections added to the DVD & Blu-ray Release Report's database. The next generation of auteur filmmakers officially has a new member — it takes a body of work over a number of years to get there. Alexander Payne is the next generation auteur. All of this — about a new member and all — is totally meaningless if you don’t at least acknowledge the auteur film theory, which arose from the French New Wave during the late 40s and early 50s. If I simply say “Truffaut” and a light goes on, then you can embrace the concept of auteur as an element of filmmaking. Who is an auteur can, however, be very subjective. One film does not make an auteur … it is a body of work. There is a consensus that Scorsese, Altman and Allen are all auteur filmmakers — but what of Spike Lee, as an example … his films of late have lost their touch; the passion that marked his earlier work seems missing. Does he just go from being an auteur to not being an auteur … it’s subjective. So what does all of this have to do with what Paramount Home Media announcement this past week with respect to the release of Alexander Payne’s latest film on Mar. 20 as a three-SKU home entertainment product offering? With Downsizing, a case can be made that he has enough of a track record to be a full-fledged member of the auteur school of filmmaking. Election with Matthew Broderick and Reese Witherspoon was amazing, Sideways teaming Paul Giamatti and Thomas Haden Church was genius and Nebraska brought out the best of Bruce Dern. There’s an unmistakable melancholy to the lives of Jim McAllister, Miles Raymond and Woody Grant (the characters played by Broderick, Giamatti and Dern respectively) in all of these Payne films … and so too is the character that Matt Damon plays in Downsizing. There’s an incredible sadness to him; Paul Safranek (Damon) is a man defeated, who surrenders to his fate; his lot — his small lot — in life, only to discover that it’s all a big con. He lives the life of luxury in a glass cage. Downsizing didn’t do the business that it should have done as an Alexander Payne film, pulling in just $24.4 million in domestic ticket sales. Take one look at the trailer and you can see that Paramount’s theatrical marketing had a difficult time telling audiences what it was about in just three minutes. The sad truth of theatrical marketing is that you have to have the maximum number of bodies possible in seats on the first Friday and Saturday nights for a film to succeed. 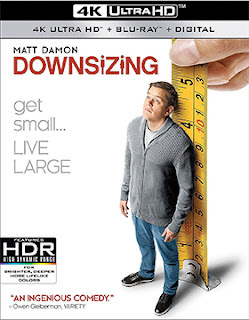 Is Downsizing a comedy? No. Is it an amusing sci-fi film? No. A satire? That’s closer to the mark … it’s actually a dramatic science fiction satire with a touch of humor to it. That’s a tough sell in three minutes. It’s also dark and challenging. Downsizing makes you think. For the record, the ARR comes in at 88 days and Paramount will be giving consumers DVD, Blu-ray/DVD Combo Pack and 4K Ultra HD/Blu-ray Combo Pack editions to select from on Mar. 20. 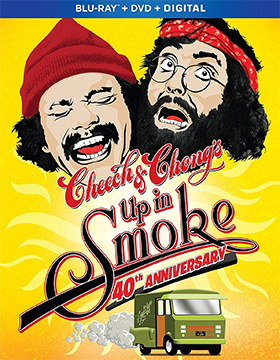 Also added to the release calendar this past week from Paramount Home Media is a 40th Anniversary Edition Blu-ray edition of Grammy-winner-turned-director Lou Adler’s Up in Smoke, which served as a theatrical showcase for the comedy talents of Cheech Marin and Tommy Chong, but turned into a cultural event. Needless to say, it was a smash, not only as a theatrical release, but as the launch vehicle for the four-decade long film careers (acting, directing, producing, etc.) of both Cheech Marin and Tommy Chong. The street date is Apr. 10. Bonus features are still in the works, but published reports indicate that there will be a commentary track featuring Cheech Marin and Lou Adler. Also streeting on Apr. 10 is director Tommy Chong’s 1983 comedy, Still Smokin’, teaming Cheech and himself on an “Amsterdam” adventure. 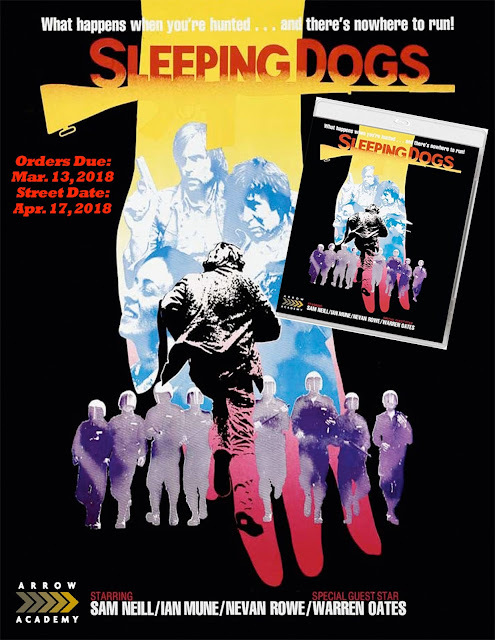 Mill Creek Entertainment gave consumers a pick of what is coming in April in the price-to-collection DVD and Blu-ray release category. Just a tease … one collection on both DVD and Blu-ray, with more, much more, to follow! Available on Apr. 4 as both double-disc DVD and Blu-ray product offerings from Mill Creek Entertainment is the four-film collection titled Charles Bronson 4 Movie Collection. 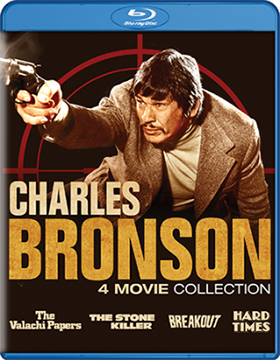 Included in this collection are four action classics starring Bronson! This kicks off with director Terence Young’s 1972 film adaptation of Peter Maas’ 1969 crime tell-all novel, The Valachi Papers. Bronson stars as Joe Valachi, a member of the infamous Genovese Mafia “family,” who went before the U.S. Senate in 1963 (just prior to Kennedy’s assassination) to testify as to the inner-workings of the Mafia — a direct violation of the Omertà, which earned him a death sentence by Vito Genovese! Next up is director Michael Winner’s 1973 film adaptation of John Gardner’s novel, “A Complete State of Death,” which was re-titled for the screen as The Stone Killer. This time Bronson is on the right side of the law as detective Lou Torrey, who stumbles upon a Mafia revenge plot — “The Night of Sicilian Vespers” — dating back to the early 1930s. The third film title in this all-action collection is director Tom Gries’ 1975 thriller, Breakout, where Bronson stars as a helicopter pilot who is hired to break an innocent man (Robert Duvall) out of a high-security Mexican prison. 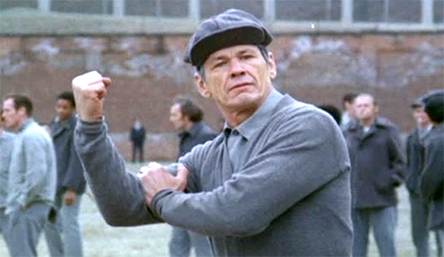 And lastly we have auteur filmmaker Walter Hill’s 1975 Depression-era fight drama, Hard Times. Bronson is a brawler and James Coburn is a shifty promoter … together they work their magic on the streets of New Orleans. Of note, Charles Bronson’s wife, Jill Ireland co-stars in The Valachi Papers, Breakout and Hard Times. Arrow Video, with domestic sales and distribution expertise provided by MVD Entertainment Group, looks to Apr. 17 for a newly-prepared Blu-ray edition of director Roger Donaldson’s 1977 (released theatrically in the domestic market in 1982) film adapation of C.K. Stead's novel, “Smith’s Dreams,” which was re-titled for the screen as Sleeping Dogs. Parallels in Hitler’s rise to power in Germany are used by Donaldson (No Way Out, White Sands, Dante’s Peak, Thirteen Days, etc.) to create a frightening narrative about martial law being declared in New Zealand … with the United States unwittingly coming to the aid of the newly formed totalitarian government to help “put down” the rebels. 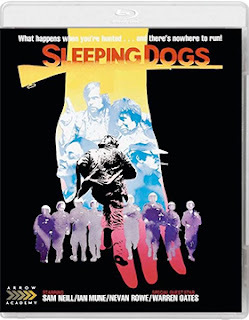 This was Sam Neill’s first starring performance (My Brilliant Career was to follow two years later) and he plays a father in the middle of a custody battle who is innocent of any involvement with “the rebels,” but nevertheless become a man on the run and eventually comes around to joining those in opposition to the government. Bonus features included with this Blu-ray release from Arrow Video include commentary by writer-director Roger Donaldson, who is joined by Sam Neill and actor-writer Ian Mune and documentary filmmaker John Reid’s 2004 feature-length film titled The Making of 'Sleeping Dogs. Bobbi Jene Smith, dance legend with the Batsheva Dance Company, is the subject of documentary filmmaker Elvira Lind’s award-winning documentary, Bobbi Jene, which will be making its way to the home entertainment marketplace on Mar. 13 courtesy of Oscilloscope Laboratories as both DVD and Blu-ray product offerings. The film made its debut at the Tribeca Film Festival last April, where it won the prestigious Jury Award for Best Documentary Feature, as well as Best Cinematography in a Documentary Feature and Best Editing in a Documentary Feature. It continues to work the festival circuit, both domestically and internationally, and Bobbi Jene got an ever-so-brief arthouse run right after Labor Day (just three venues). For the record, the ARR comes in at 172 and box office receipts from the film’s limited showcase are $18,579. Oscilloscope’s Blu-ray and DVD release on Mar. 13 will afford fans — and curious — an opportunity to view Lind’s film (that wider audience that is not conveniently near one of the country’s major metro arthouse cinemas). The film gives us a glimpse into her work with choreographer Ohad Naharin of the Batsheva Dance Company and the harsh reality that after ten years it is time to move on … Bobbi Jene needs to explore the world beyond “her” dance, to that of choreographer; of creating. Through interviews with her contemporaries, intimate scenes with fellow dancer, Or Schraiber and a showcase of a provocative performance piece that she developed with the Jewish Museum, filmmaker Elvira Lind gives us a rare glimpse into Bobbi Jene’s world, where dedication to dance is everything! Also being released on Mar. 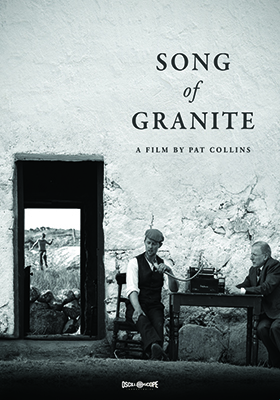 13 as both DVD and Blu-ray editions is writer/director Pat Collins’ Song of Granite, a dramatic presentation of the life of famed “sean-nós” artist Joe Heaney. The film opened at the South by Southwest Film Festival last March and worked the festival circuit both here and abroad until just before Thanksgiving, when it got a very limited domestic arthouse run. The ARR is 116 days and box office receipts stand at $16,182. As a young boy I would listen to my grandmother speak in Gaelic to her friend, Violet. It was a mysterious language that I could not make heads or tails of, but it was so, so beautiful in its lyrical nature. To hear the songs — the “old style” songs — of Joe Heaney (aka: Seosamh Ó hÉanaí) is to be, for me, whisked back to those days of Gaelic spoken among friends. Collins’ has taken an interesting approach to the telling of Heaney’s career, he does this by blending documentary film techniques with a dramatic presentation of Heaney’s journey from Ireland to the Unites States … three different actors portray the artist at various points in his life. The film is also bold in its presentation as it is filmed in stark black and white … there’s a melancholy nature to all of it; the songs; the visuals. Writer/director Pat Collins’ Song of Granite is presented in Gaelic and English, with English subtitles. There is also a “Behind the Scenes” featurette included.